We have now finally left our comfort zone. Treading on new grounds with every rotation of the tires as we head east with Mali Mish in tow is more thrilling than we have imagined. And it is only getting better by the minute. Today is our first and only full day in New Mexico and neither Marlene nor I have ever been here before. 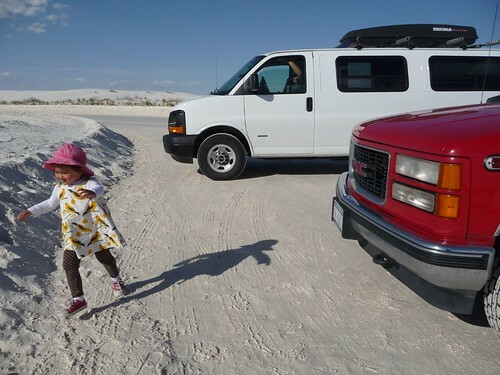 After a quick breakfast in the Airstream we packed up our cooler bag with some lunch goodies and headed up the hill to check out Whites Sands National Monument. 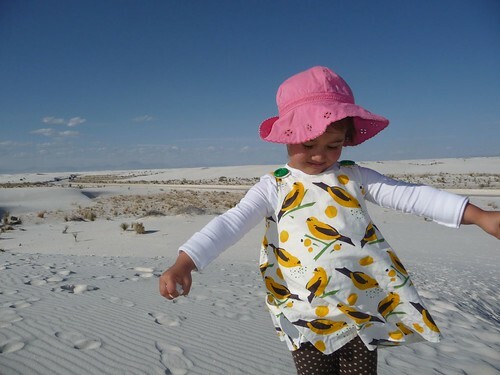 White Sands National Monument is a pretty awesome place. 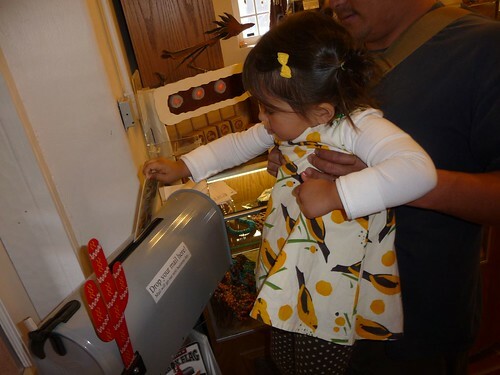 We started the trip out by first checking out what the visitor center had to offer. We watched a short video on the history of the monument. It explains how the sand dunes are made as well as how it became a national monument in order to preserve it for future generations to enjoy. In the gift shop we decided to start a small new tradition. Buying and sending post cards to ourselves. With all of our digital photos, videos and blog posts, we thought this old-school keepsake would be just the right thing for us to have as a souvenir. The best part is we won’t have to lug it around the country with us. We made some sandwiches by the visitor center and headed into the park shortly after. 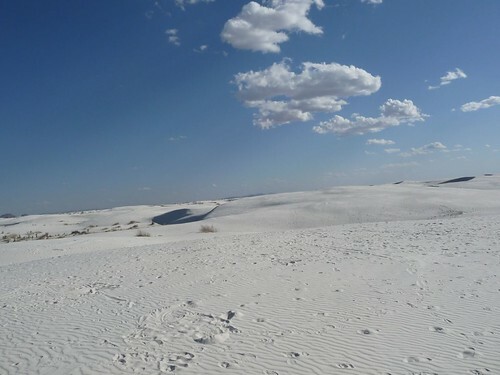 The sand dunes at White Sand National Monument span as far as the eye can see. This being the world’s largest sand dunes of its kind, it is literally something you will not see anywhere on earth. 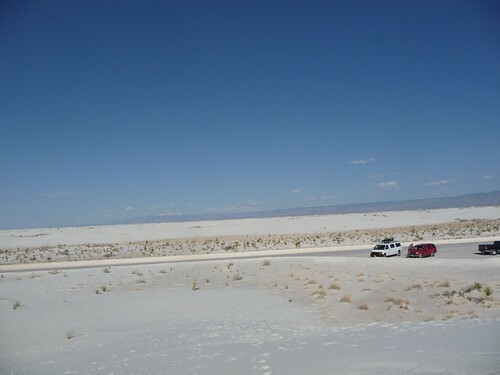 The white sand here is a special kind of sand that’s made up of gypsum originating from the Tularosa Basin. The gypsum is washed off and carried down from the neighboring mountains by rain as it flows to the bottom of the basin. 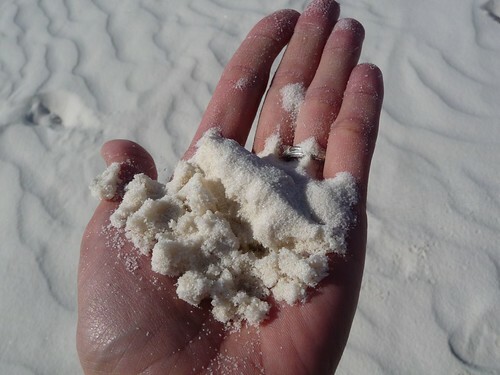 Since it can not drain to the ocean as most gypsum deposits would elsewhere, it forms gypsum crystals when the water evaporates during the hot summer months. The prevailing winds blow and carry small amounts of the crystal constantly across the desert surface. 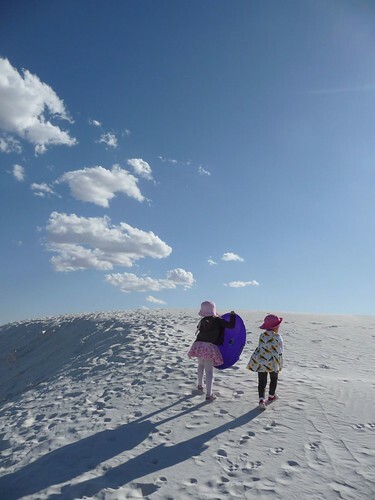 Over millions of years, all the little pieces of gypsum crystal have gathered themselves into what we see today as an endless see of gypsum sand dunes. As the winds continue to blow, the larger pieces get ground down to sand so incredibly fine, it is difficult to see just a single grain at a time. Ava and Sophia had been wanting to play in a sandbox ever since we were in Bisbee. I think they got more than they bargain for here. As usual, my work schedule dictates that I work whenever and wherever I need to. 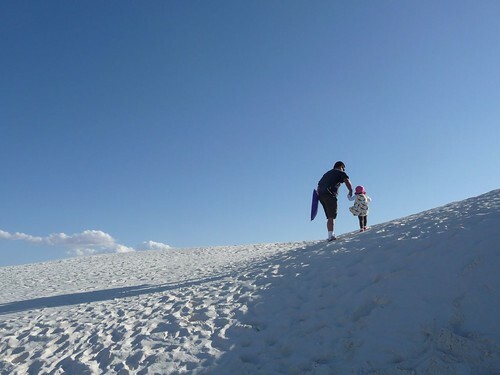 I had a conference call to make so I had to stay behind in the car while everyone climbed up on the sand dunes for a little sledding. I was pleasantly surprised that my Sprint cell phone reception was very good several miles into the park. Check out a closer shot of what the white sand looks like. It is remarkable how smooth the texture is when you are hold some in your hand. The beaches in Ventura in comparison is like a shore of gravel. We had the most beautiful weather when we were there. I bet it must be ridiculously hot in the summer time to come here. Since there is no water once you enter the 8 mile road that takes you into the dunes, you really need to come prepared. When we told Ava we were taking her to see the beach, she was really excited. But I think she was a little confused about why this beach had no oceans near it. 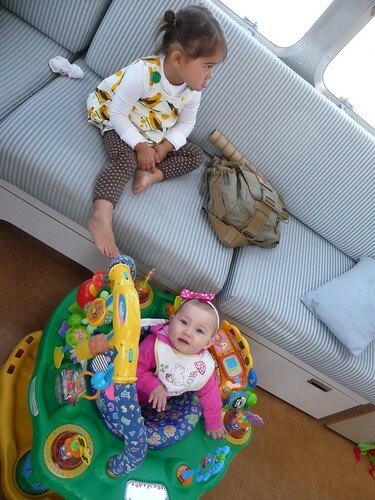 Marlene had Mila in the baby carrier most of the time. 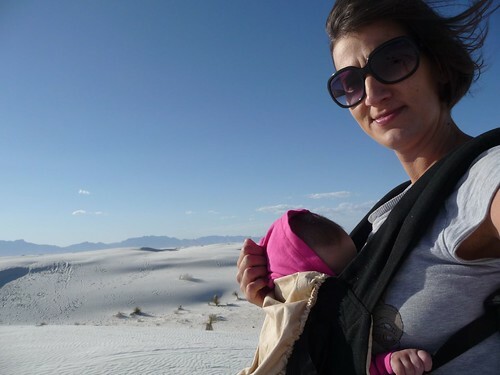 She is in her grabbing stage right now so letting her loose would have meant fists full of gypsum sand in the mouth. The ecosystem in the park is fairly typical of what you would find in the desert. Snakes, beetles, some small mammals and other various types of wildlife roam freely in the evening. As they are nocturnal, you will not see anything during a day time visit. 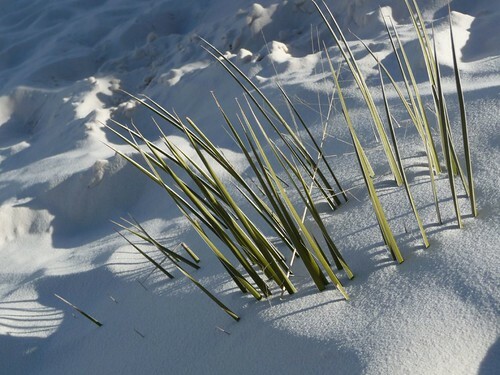 When you see plants sticking its leaves through the top of a 30 foot sand dune, it means that this plant is actually 30 feet tall with its roots firmly planted in the desert floor on the bottom of the dune. After an hour sitting in the car watching everyone, I finally finished my work and got to join in on the fun. 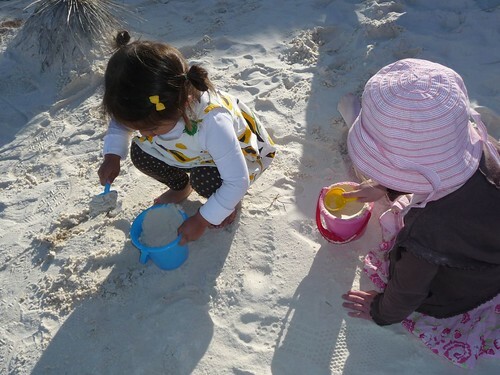 When the girls got a little worn out from climbing up and down the dunes, I busted out the bucket and shovels for them to make the biggest white sand castle in the world. At a quick glance, if you didn’t know any better, you can easily mistaken the white sand for snow if you have only seen it in photos. It is actually quite like snow since it is less grainy and more flaky. It might even be better than snow for the kids since they do not have to get bundled up in snow gear or get their hands cold and wet to have fun in it. The road that is made to allow tourists to drive into the dunes also has to be plowed every day as the shifting sand would just completely devour them otherwise. You are not allowed to take the sand home with you, but it is really hard not to. This stuff just gets everywhere. 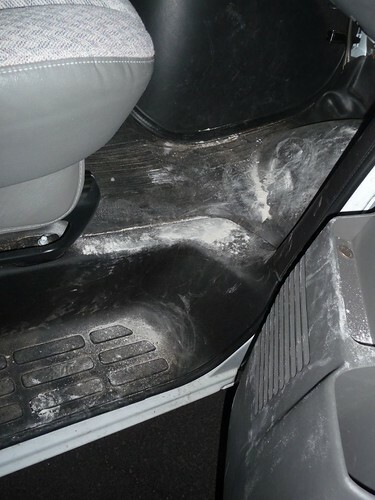 In your shoes, socks, pockets and eventually all over the car. 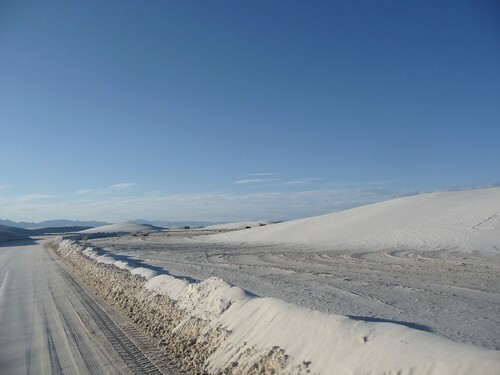 I am sure we will still be finding white gypsum sand on us when we are thousands of miles away from here. 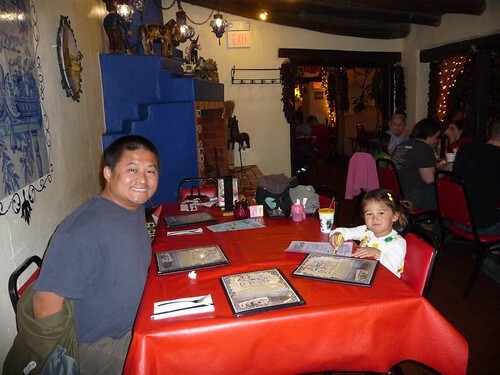 Las Cruces New Mexico has a small little historical district called Mesilla with some great Mexican food restaurants. 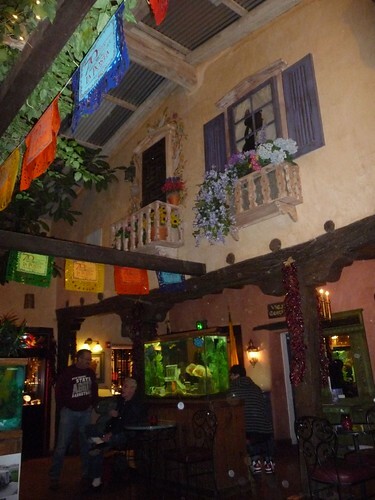 One of the notable places it called La Posta De La Mesilla near the main plaza courtyard. Being a weekday night, we didn’t think there would be any wait to get a table here. But we ended up waiting over an hour for a table and probably a good 45 minutes from when we ordered the food to actually get it to our table. What is a guy to do with that kind of time on his hands? 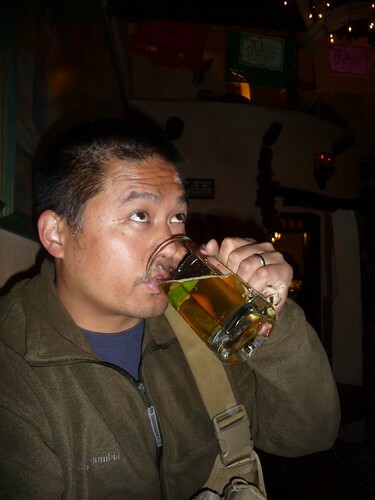 Well, enjoy a mug of Dos Equis lager of course. The food really lived up to all of the expectations and we all left the place holding our guts from stuffing them too full. When we came to New Mexico, we didn’t really expect to have great Mexican food since we always thought we have had the best of the best in California and Arizona. 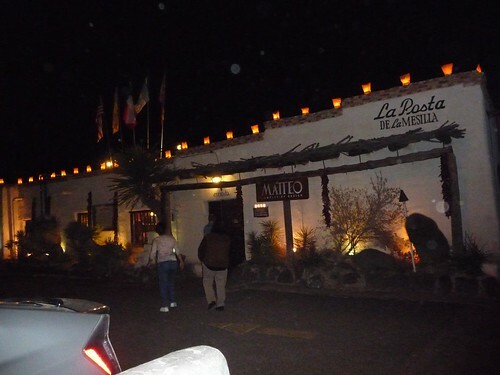 La Posta turns out to be well worth the wait and we would recommend it that anyone coming through Las Cruces to stop by and try their chile rellenos. Our only full day in New Mexico, as we head eastbound, was one of the best days so far on the trip. Hopefully we will be driving through the northern part of the state our way back towards California. Tomorrow, we are packing up and heading out again in the morning. Destination, Texas! Day 14: Out of Arizona and into New Mexico. Day 16: Good-bye New Mexico. Hello Texas. Where in Texas are you heading to? Have you visited Texas before? We just spent several months in Texas…..not to be a downer, but we were not impressed. 🙂 And we have traveled to a alot of different places. 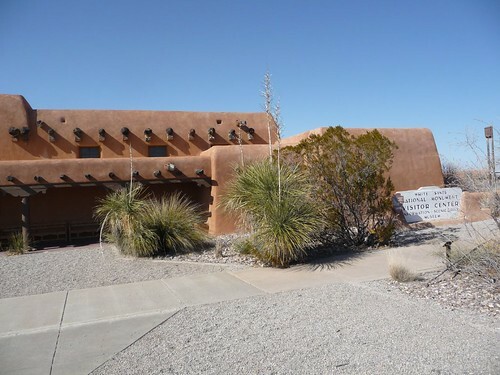 We were hoping to have the old western Texas experience – you know like the one you have seen on the cartoons as a child. We really hope you have a great time and perhaps you will find something we missed. But Texas to us is a great big empty state. And we aren’t sure how the state got its title “The Friendly State” because the people we ran across were far from friendly! 🙂 We will be wintering in a different southern state next time.